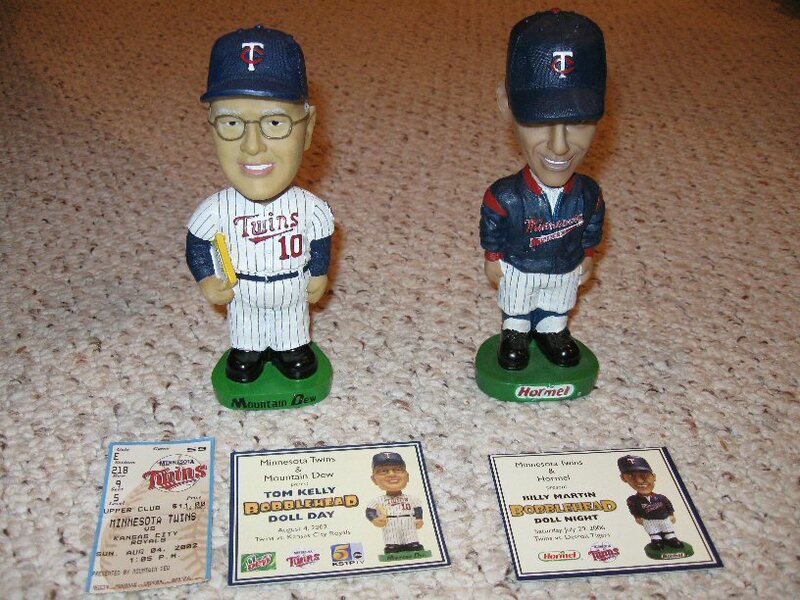 1991 Twins Bobblehead Set Has Arrived! Pedro Gonzalez Return After 1005 Days! Today I started getting back some of the requests I sent out last week. 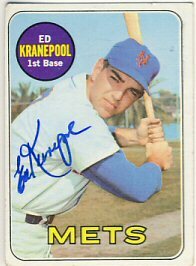 Ed Kranepool signed his 1969 Topps and a Ron Lewis 1969 Topps postcard. 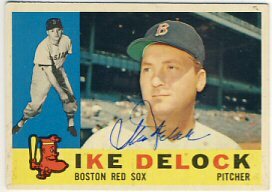 Ike DeLock signed his 1960 and 1961 Topps, as well as the Red Sox team card from 1958. 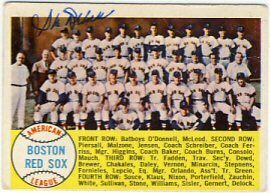 I haven't gotten any of the team cards signed from that set yet, but decided to since I'm running really low on cards that I don't already have from that year. 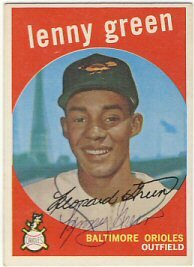 And Lenny Green signed a 1958 and 1959 Topps. 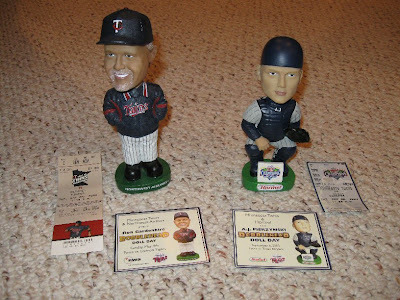 Today I received back to two signed bobbleheads from the 1991 Twins bobblehead set. A sportscollectorsnet.com member took some items to a 1986 Mets reunion signing and was able to get my bobbleheads signed by Rick Aguilera and Terry Leach. 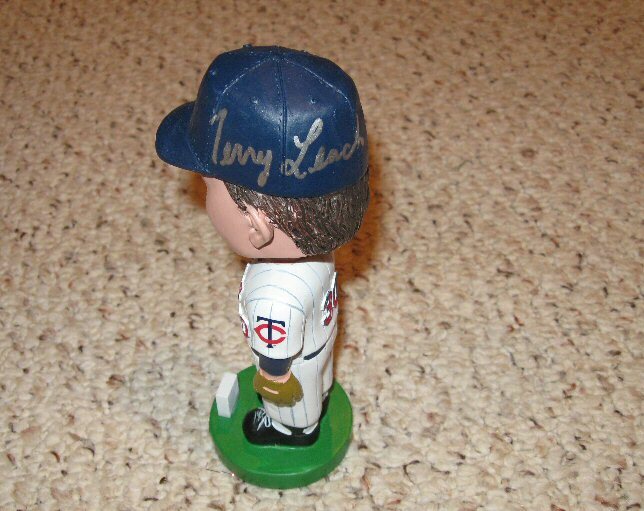 I was happy to get Leach since I missed him when he was signing in Minnesota because I hadn't received my bobblehead set yet. I sent the Scott Erickson bobblehead off to the same SCN contact to get signed. as well as the David West bobblehead to a different mail-in signing. I'm off to a quick start on this set. I hope to get many done at TwinsFest this year. The first of my latest bunch of ttm request was returned today. 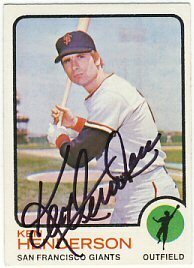 George Mitterwald helped me further a couple of my 2011 collecting goals by signing his 1970 Super Valu giveaway portrait by John Wheeldon. 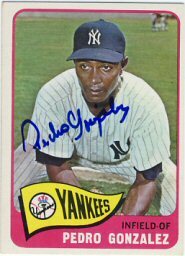 He also signed both of his 1972 Topps for me. I had purchased the "In Action" card from Mickey's earlier this year so I'm just adding one more to my total, which is now 290, just 10 short of my goal of 300. 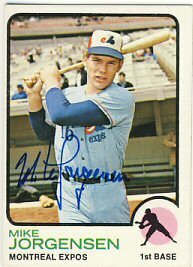 I also received a 1973 Topps signed by Mike Jorgensen that I purchased on Ebay from a fellow Twins collector and SCN member. Thanks Randy! 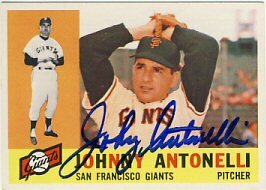 A generous SCN member offered to take items to a Johnny Antonelli signing that occurred last weekend. I sent a 1959 Baseball Digest and a 1960 Topps. I received both back today and they look great. I even received a photo of Mr. Antonelli signing my magazine! 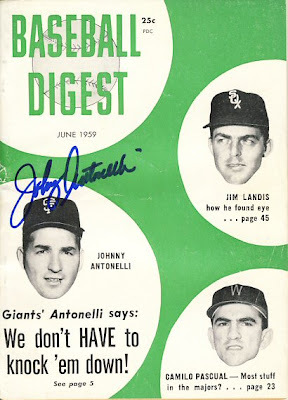 The magazine also has Jim Landis and Camilo Pascual on the cover. I'll try to get them to sign if I find a mail-in signing. I don't think I'll risk sending it to them directly. 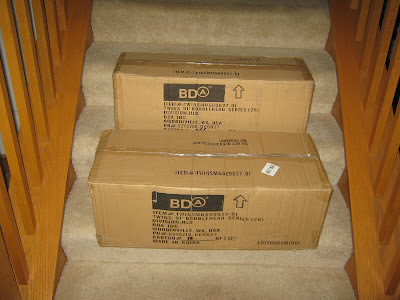 Today I received a few bobbleheads I bought on Ebay. These aren't rare, or signed, but some that I don't have in my collection yet. There's probably no way I'll get the Eddie Guardado one signed, but maybe Brad Radke will be at another TwinsFest so I can get his signed. I'll probably be able to get the Tom Kelly bobblehead signed, right after I get his signed form the 1991 World Series set. 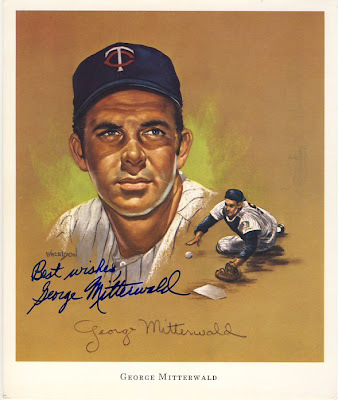 I also bought a Billy Martin. 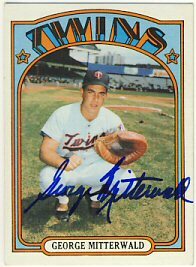 I'll also be able to get Gardenhire to sign his at TwinsFest, but I doubt I'll ever see A.J. Pierzynski again so his will probably go unsigned. 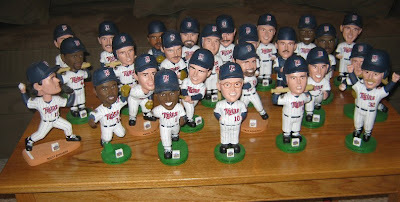 My rough calculation brings my Twins bobblehead collection set up to about 85. Yikes, where am I going to put all these? Since the update on my collecting goals is over 3 weeks late, you can guess how I'm doing on my actual goals. My sons and I have been golfing 1-3 times a week, usually on the evenings I would normally be sending out requests. With the days getting shorter and temperatures dropping here in Minnesota, our golfing days are nearly over so my requests should pick up. Send out 250 requests through the mail - As of today I have sent out 178 requests this year. 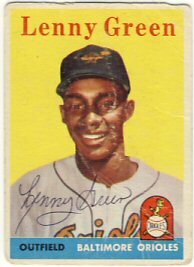 Hitting 250 is looking to be a challenging goal, especially since I don't have too many cards to send out. 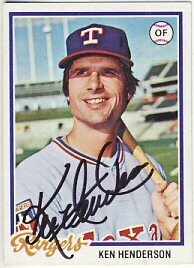 Reach 300 signed 1972 Topps cards - I'm at 289 right now. 300 signed cards by the end of the year is very achievable. 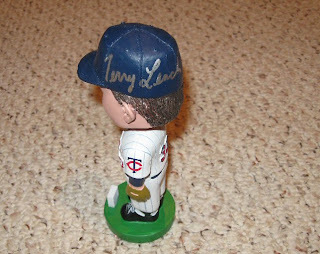 Add 5 more signed bobbleheads to my 1987 Twins bobblehead collection. 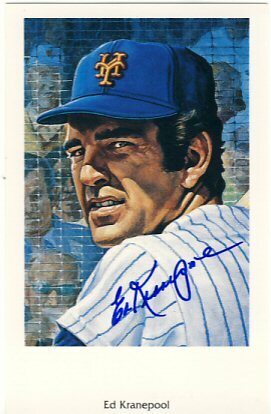 So far I've added 4: George Frazier, Dan Schatzeder, Keith Atherton and Jeff Reardon. I still need to add one more by the end of the year and will need to make it a priority to keep my eyes out for an opportunity. 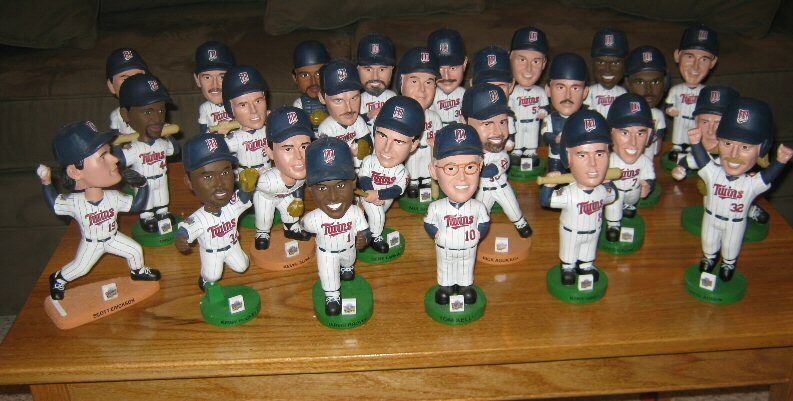 I have recently sent out three bobbleheads from the 1991 set I recently received, but I guess that doesn't count. Finish the 10 possible John Wheeldon portraits (out of 12) - I got Rich Reese back a while ago. I need George Mitterwald and Ron Perranoski. Unfortunately, Harmon Killebrew passed away. 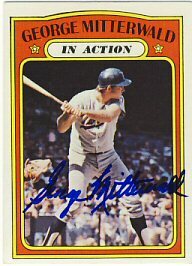 I sent out the George Mitterwald portrait today along with a couple of 1972 Topps. I'll send out the Perranoski on Monday. 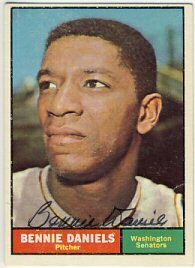 If I get some cards and spend about 4 evenings writing some letters, I should hit my 1972 Topps set and overall ttm requests goals. 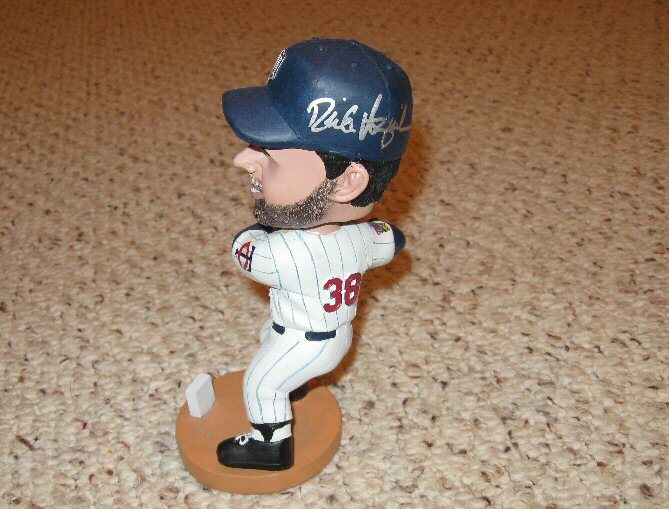 The tough one will be getting that last 1987 Twins bobblehead signed. 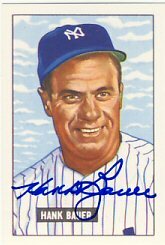 I added another Ron Lewis Living Legends autographed portrait to my collection this week. 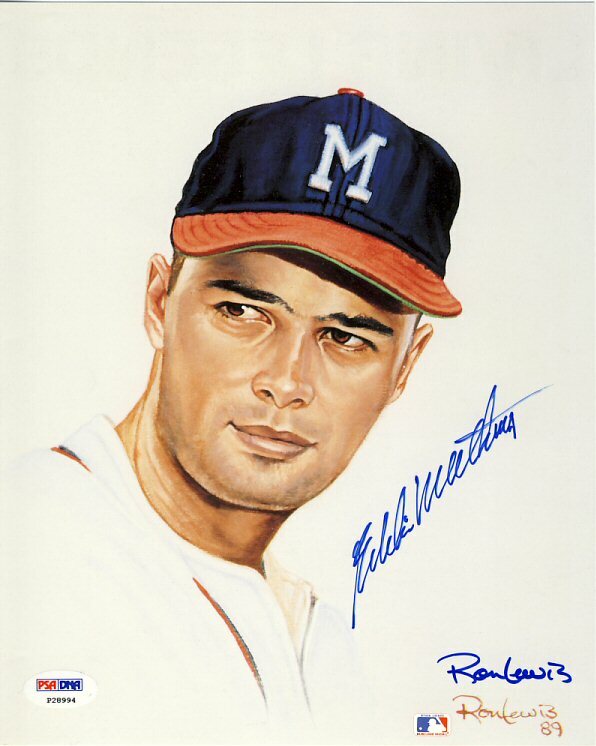 I purchased a PSA/DNA-authenticated Eddie Mathews on Ebay. It's also signed by the artist. I'm slowly adding a bunch of these to my collection. I have nine of the twenty now. 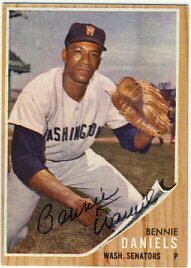 I'm still missing some big names like Koufax, Mays and Drysdale. 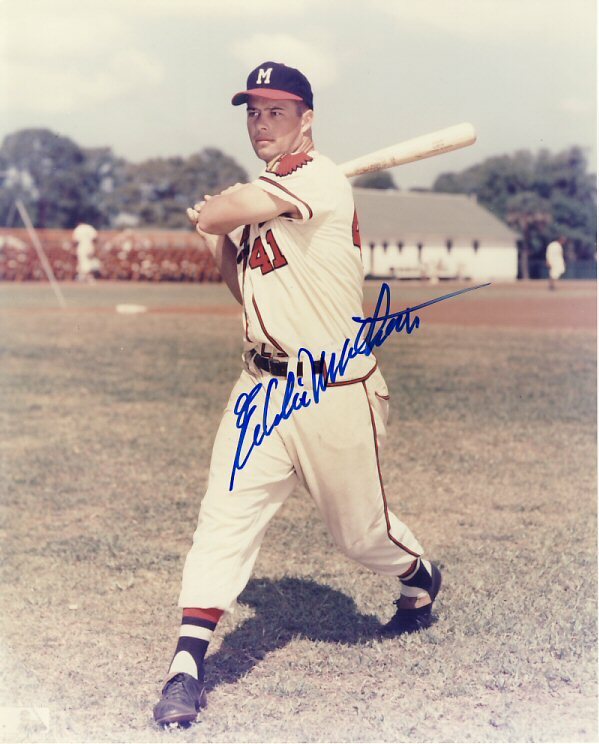 Coincidentally, I also bought an Eddie Mathews signed 8x10 from a fellow sportscollectors.net member. I'm hoping to have some time this weekend to send out at least 10 through the mail requests. We'll see if I actually get around to it. My son got back a great return today. 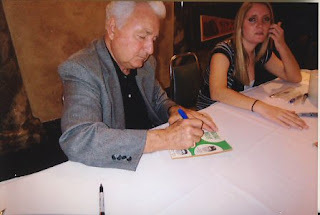 I gave him a 1958 Topps Al Kaline and $10 for his birthday to send the card off to get signed. He got it back today. 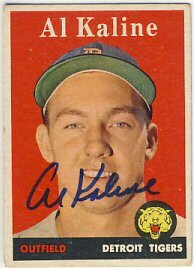 I think this is one of the nicest vintage cards to get signed, and Kaline always signs nicely. 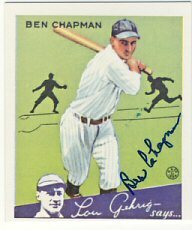 I bought a lot of 5 signed cards, mainly to get the 1934 Goudey reprint signed by Ben Chapman. 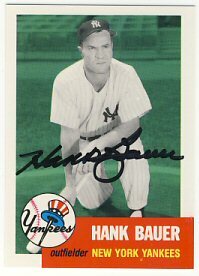 The lot also included a 1951 Bowman reprint and 1991 Topps archives signed by Hank Bauer. 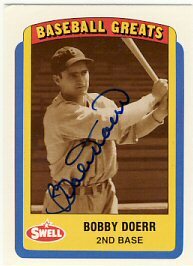 A 1990 Swell signed by Bobby Doerr. And a 1988 Pacific signed by George Kell. 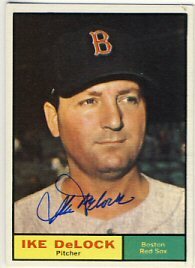 Today I received a nice return from a very reliable TTM signer. 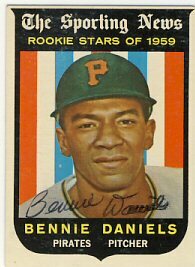 Bennie Daniels signed a 1959, 1961 and 1962 Topps for my collection. 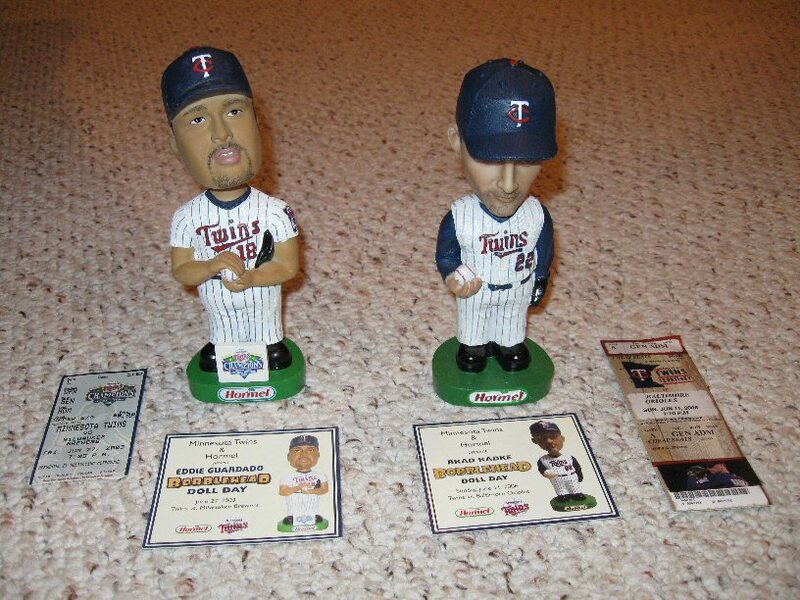 I sent off the 1991 Twins bobbleheads of Rick Aguilera and Terry Leach on Saturday. They should come back the last week in October. I have very few cards to send out. I need to make my way to a show and buy a bunch more to send out. 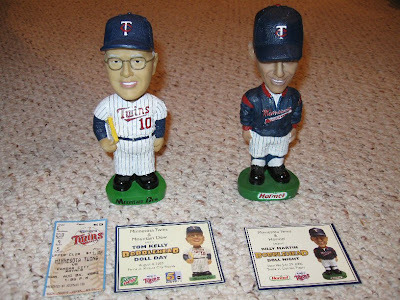 Finally, I received my 1991 Twins bobblehead set, which I ordered back in August. This set came in two separate boxes. These bobbleheads feel much lighter than most other bobbleheads. Maybe there's more plastic in them? A different type of material? The paint job is as sloppy as ever, but the likenesses of the players are better than most. This set also has a wider variety of poses, which is nice. Some of the pitchers are on a brown base, rather than the typical green. Surprisingly, I only had a couple with any type of damage. The small plaque on the Jack Morris figure was glue face-down, and prying it up left some of the white of the plaque stuck to the base. I'm not sure if I'll try to get a replacement or not. One of the heads also came off one of the bobbleheads as I was putting it away. This is pretty common. I'll just glue it back on. The same thing had happened to my Sal Butera bobblehead from the 1987 set. When I sent it in to a signing, I just mailed the head rather than the whole body, and glued it back on after I got it back. There is a 1986 Mets reunion coming up in a couple of weeks. 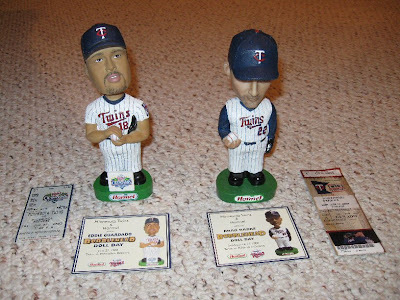 I am trying to arrange a deal with an SCN contact to take my Terry Leach and Rick Aguilera bobbleheads to get signed. I'm hoping I can get 4 or 5 of them signed at TwinsFest next January as well. Tom Kelly, Kent Hrbek, Kevin Tapani and Al Newman should be pretty easy. 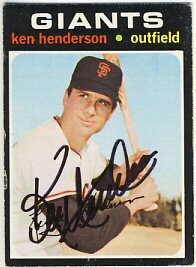 I received a nice return from Ken Henderson today. 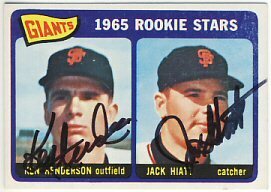 In addition to a Topps cards from 1971, 1973 and 1978, he signed a 1965 Topps already signed by Jack Hiatt. Since September is over, I need to review my goals for the year. I didn't make much progress since the end of July I'm afraid. I'll update my progress against my goals later this week. I received a couple of long returns today. 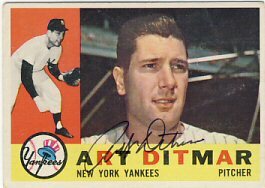 First, Art Ditmar signed and returned a 1960 Topps that I sent last May. 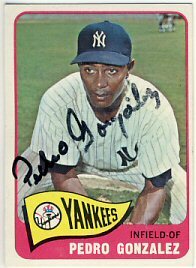 And Pedro Gonzalez signed and returned my 1965 Topps after 1005 days! I sent it on 1/2/2009. I had enclosed $10 with my request. 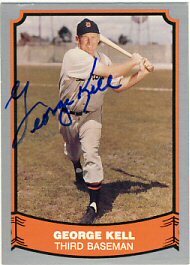 I have since purchased this card signed but am really happy to get this one back.